Pro-Tech Roofing has been serving property owners in Jenks since 2003. If you have a need for professional roofing services in Jenks, we would love to help you. We fix roofs and replace roofs on all types and sizes of residential or commercial properties. Our Tulsa showroom is located just minutes from everywhere in Jenks, and we welcome the opportunity to give you an honest, fair estimate for your roofing needs. We all know that Northeast Oklahoma homes take a beating each spring and summer with tornadoes, hails, and heavy winds. Roof leaks in Jenks homes are fairly common, especially on older homes. But even with newer homes (if your home has ever been hit by hail), it’s important to get your roof inspected by an experienced Jenks roofer that knows what they are looking for. A qualified roofing company can identify the subtle signs of roof hail damage. And let you know what needs to be done to fix your roof. Our clients consistently tell us that they love the personal attention they receive from Pro-Tech Roofing, even for very small roof repair projects. We are a different from other Tulsa roofing companies. We won’t offer a roofing solution that you don’t need. We want to fix your problem roof for the most reasonable cost. And that can often be accomplished with a roof leak repair. If you look at your ceiling and see water spots, you need to call a Jenks roofer. The sooner you call, the cheaper your roof repair will be. 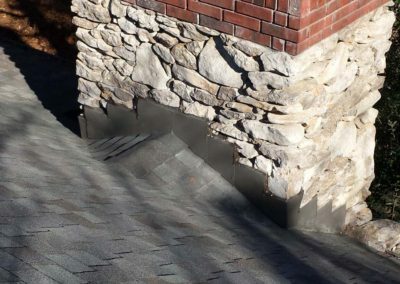 If you don’t see evidence of water leaks, but you have a missing shingle here or there, it’s important to call a Jenks roofing company. We offer free roof inspections for Jenks homeowners. We will closely examine your roof and tell you exactly what needs to be done to fix any problems we may find. We always offer upfront pricing, so you can rest easy knowing you will get a professional Jenks roof repair for a fair price. We repair roofs on all home sizes in and around Jenks, Oklahoma. We will also provide commercial roof repair in Jenks. If your roof can be repaired without a full replacement, we will tell you and offer a good roof repair estimate. However, we may suggest a full roof replacement as the best solution. We will present different roofing material options available for your home and offer a detailed estimate for roofing services. If you think you may have an insurance claim for storm damage, call us for a roof inspection before filing a claim. This could save you from filing a claim that does not get approved. A professional evaluation of your roof can help you determine whether or not you do in fact have wind or hail damage. We will help guide you with the insurance claims process. A new roof on your home is a big (but important) investment. A water-tight roof protects more than just the contents of your home. It protects your family. And it protects the integrity of the structure of your home. A new roof adds value to your Jenks home. When choosing a roofing contractor in Jenks, it’s important that you work with a local roofing company with a long history of helping homeowners with Jenks roofing services. Pro-Tech is a Jenks roofing company with a long track record of success. Jenks was originally settled in 1904 by the Midland Valley Railroad and was an important trade stop along the Arkansas River between Tulsa and Muskogee. Jenks is home to the Oklahoma Aquarium, a world-renowned aquarium featuring sharks, sea turtles, extreme fish and exhibits featuring wildlife found in Northeast Oklahoma. Live nearby? We also provide – Glenpool roofing services, Sand Springs roofing and Sapulpa roofing, as well as roofing all over Green Country. Our local team of Jenks roofers will take great care of you and your property. In addition to Jenks roofing services, we gladly offer roofing services to property owners in all surrounding communities, including: Bixby, Coweta, Claremore, Collinsville, Owasso, Glenpool, Inola, Tulsa, Skiatook, Sand Springs, Sapulpa, Grand Lake.